Nokia suggests it will be 1st to WP8, maybe? 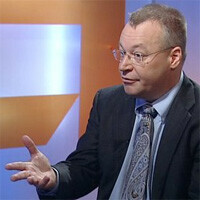 Nokia CEO Stephen Elop spoke to analysts today about a number of pertinent subjects surrounding Nokia. From the company’s reports of huge losses to the lack of upgrade options for current Lumia owners, Elop was asked a number of difficult questions that he seemed to mostly dodge around. When asked if Nokia would be the creator of the first Windows Phone 8 handset, Elop only pointed out that Windows Phone 8 has been demoed on Nokia’s hardware and that the company as a “close relationship” with Microsoft. He described that relationship as “unlike what anyone else has with Microsoft,” but never directly answered the question. While Windows Phone has slowly gained momentum and has celebrated a number of victories and milestones, there doesn’t seem to be any other manufacturers behind Windows Phone in the way that Nokia is, so it is odd that Nokia still isn’t jumping on and promoting the opportunity to be the first WP8 handset. When asked about rewarding early Lumia adopters with an upgrade to a WP8 handsets, Elop once again danced around the question and simply reiterated that WP7 phones would get some WP8 features such as the start screen and live tiles and then insinuated that current Lumia device could see continued price cuts as we move closer to the launch of Windows Phone 8. Finally, Elop denied allegations that Windows Phone would be struggling with fragmentation issues by saying that over 60% of Android devices are 3 versions older than the current iteration, yet they continue to sell well.
" Elop only pointed out that Windows Phone 8 has been demoed on Nokia’s hardware and that the company as a “close relationship” with Microsoft. He described that relationship as “unlike what anyone else has with Microsoft,” but never directly answered the question." Special as in we get 250 million each quarter to make them :). I knew this before Nokia knew it that they will be 1st to release WP8. ``.....Elop denied allegations that Windows Phone would be struggling with fragmentation issues by saying that over 60% of Android devices are 3 versions older than the current iteration, yet they continue to sell well.`` Nobody is still selling Froyo devices Stephen. Get your a** out of 2011. Too bad that none of the journos who interview this twerp ever call him on his bs. Maybe he was counting honeycomb as seperate from gingerbread.... Ics, hc, and gb. Either way he's wrong because hc is just the tablet form of gb so it's only 2 gen. Back... Right? who says you that nobody is selling froyo? still there is! i got mine with postpaid plan, huawei u8350 rebranded as "cloudfone temptation". how is it? i really hope we could see some WP8 Nokia Lumia device on septemper's Nokia World and so is a lumia pureview!!! but on the other news, it is said that WP8 wont be release until november so a WP8 device wont be avaible on nokia world!!! im really looking forward on WP8! i dont like that the world is full of iOS and Androids!! we should look for other device!!!! i wanna see 1.) Google's Android phones 2.) Apple's iPhones 3.) Microsoft's Windows Phones 4.) RIM's BlackBerry Phones 5.) Samsung and Intel's Tizen Phones 6.) Jolla's MeeGo Phones 7.) Mozilla's FireFox Phones!!! but i wanna see some lumia pureview goodies on september's nokia world! Samsung will be the first WP9 and Nokia will be bankrupcy with WP8. lets wait and see what the outcome is. ...after they copy a few ideas from Nokia. Right because Nokia has never copied anything from Android. At least Nokia didn't copy Apple but instead receives royalties. Isn't that great! Lol so you admit that Nokia does copy from Android and yet you bash Android for copying Nokia? Makes sense! WP 7.8 update is available now?????? So Charlene S., what are you trying to get at with your negative tone. He's probably saving all the excitement for Nokia world, not for you. Of course Nokia will be the 1st to release WP8, and I predict that this will be the only serious WP8 handset in the market for a long duration of time. Others like SS or HTC only take WP as potential business option and will not really jump in until WP8 proves successful.